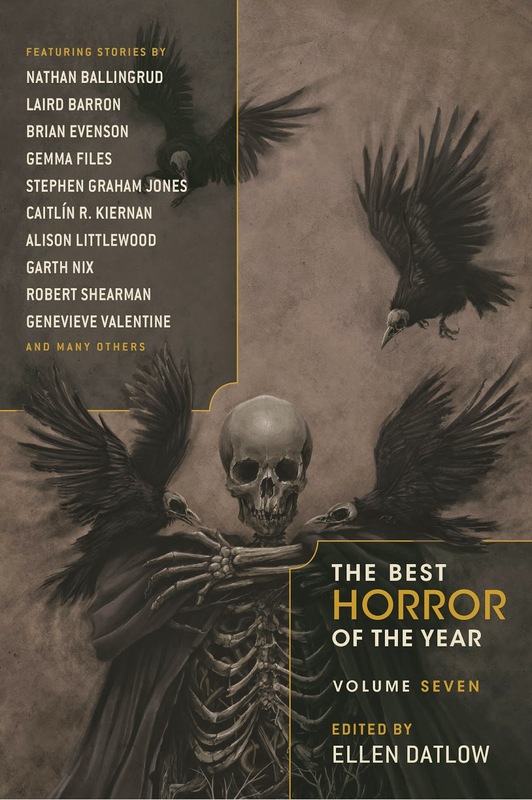 I’m delighted to announce that my story “Wing­less Beasts” was selected by editor/​anthologist Ellen Dat­low for Best Hor­ror of the Year #7! This is a huge honor as you’ll see from the TOC of authors listed below. For the past sev­eral years one of my high­lights of each read­ing cal­en­dar is Ellen Dat­low’s series of antholo­gies, “The Best Hor­ror of the Year”. Each year, since 2009, “The Best Hor­ror of the Year” not only rewarded me with some excel­lent short sto­ries, but it also offered me the pos­si­bil­ity to dis­cover plenty of oth­ers through the list of hon­or­able men­tions pub­lished by Ellen Dat­low in every vol­ume. This year “The Best Hor­ror of the Year” sees the pub­li­ca­tion of its 7th vol­ume and yet again Ellen Datlow’s anthol­ogy comes with a very inter­est­ing list of short sto­ries and a catchy, sug­ges­tive cover artwork. For over three decades, Ellen Dat­low has been at the cen­ter of hor­ror. Bring­ing you the most fright­en­ing and ter­ri­fy­ing sto­ries, Dat­low always has her fin­ger on the pulse of what hor­ror read­ers crave. Now, with the sev­enth vol­ume of this series, Dat­low is back again to bring you the sto­ries that will keep you up at night. With each pass­ing year, sci­ence, tech­nol­ogy, and the march of time shine light into the craggy cor­ners of the uni­verse, mak­ing the fears of an ear­lier gen­er­a­tion seem quaint. But this “light” cre­ates its own shad­ows.The Best Hor­ror of the Yearchron­i­cles these shift­ing shad­ows. It is a cat­a­log of ter­ror, fear, and unpleas­ant­ness, as artic­u­lated by today’s most chal­leng­ing and excit­ing writers.